VitorFaria wrote: That's a killer HVA, looks a lot like a Star Wars support vehicle! Thank you VitorFaria, although I wasn't really going for a Star Wars vide. But now that you mention it, I can't help but agree. This next one took me a while to get right. I wanted to get as close as I could to an actual Ijad design, and I think this works. I am happy with it. 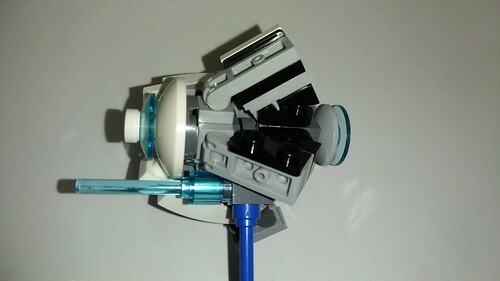 It is hard to see, but there are two travis bricks and they are connected by a lightsaber bar piece. 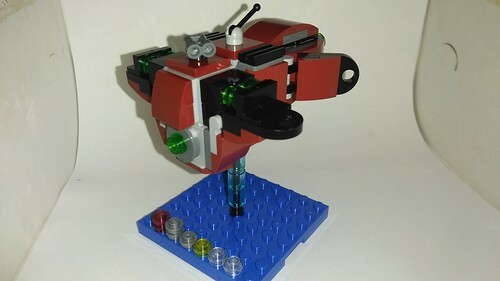 Also, there is a roboclaw connected to the bar piece, and the half travis (The 1x1 brick with knobs on 2 sides) is connected to the bar part of the roboclaw. 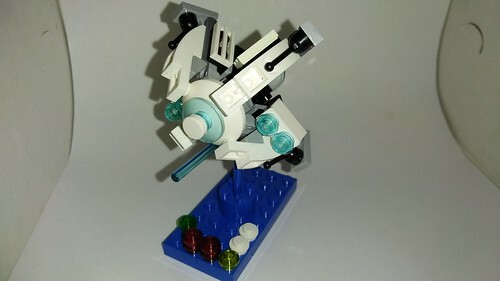 I am confident that the Lego Digital Designer will not allow me to recreate the fin connections here, so hopefully this will help for those interested in building your own. I can also do a more complete breakdown pic if requested. That's a really spot on Ijad look! As for making it an official game piece, I do not have that authority, nor would I think it would be fair because I have seen countless others that should be iconic pieces for Mobile Frame Zero. However, if someone started a compilation collection for Intercept Orbit, like how VitorFaria did one for Frames a while back, then I will definitely submit this design. Hope you enjoyed and I am always eagerly awaiting any and all comments you wish to share. In order to stay true to the theme, I had to keep the colors to black, dark grey and trans red, which, unfortunately makes taking quality pictures of them a chore (With my current layout). To assist those who can't make them out in the pictures, I'll also include an LDD file which includes all four. I hope you enjoyed and I always eagerly await any and all comments you wish to share. Don't worry about the pics, Artasid, that color scheme looks amazing! VitorFaria wrote: Don't worry about the pics, Artasid, that color scheme looks amazing! These are a little better to see in detail so I am happy. 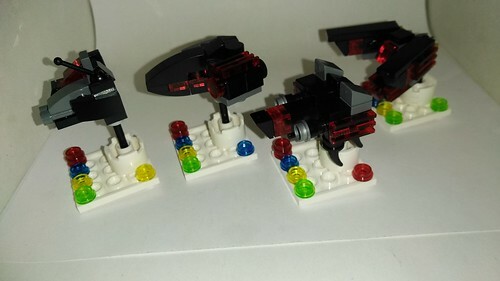 I really like the idea of just having different small ships as the frame companies/aces, but I struggle with making them all look like they belong to the same faction. What you've done here is really great! Even if the color scheme may not be correct to the source material, it's consistent across all of them, and the way you've use certain shapes on all of them, like the mixel bows, really makes them look like they belong together, even though they're all different shapes. Great stuff, I'm inspired! 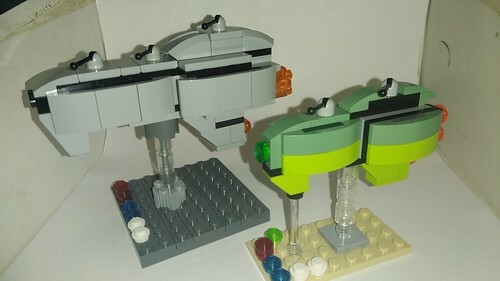 Aardvark17 wrote: I really like the idea of just having different small ships as the frame companies/aces, but I struggle with making them all look like they belong to the same faction. What you've done here is really great! 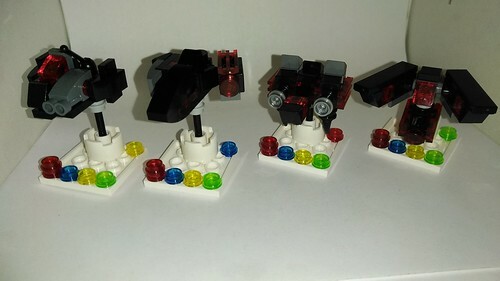 Even if the color scheme may not be correct to the source material, it's consistent across all of them, and the way you've use certain shapes on all of them, like the mixel bows, really makes them look like they belong together, even though they're all different shapes. Great stuff, I'm inspired! 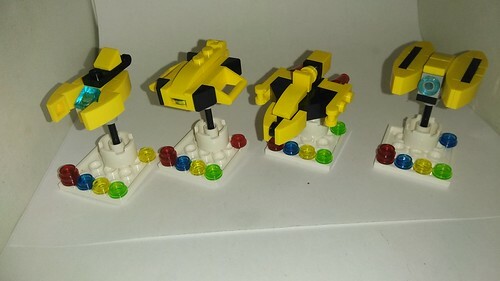 Here is the third and final set of Anti-Frame Fighter Aces. Again from the game FreeSpace, but these are the Terrans, which, oddly enough, were the hardest to get right. 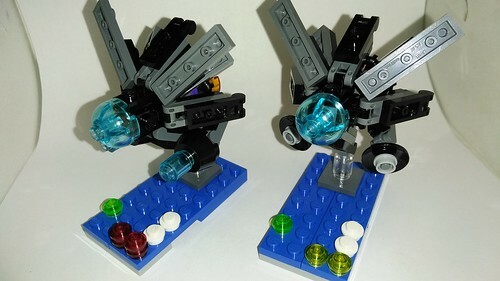 They are not exact to the source material, but the overall feel is there in my opinion. Hope you enjoyed and as always, I eagerly await any and all comments you may wish to share. Though slightly smaller and underpowered than their predecessors, the Ahu's Star does show some potential. It uses similar building techniques used in the Ahu's Point, which means they can be reproduced in shipyards that have already constructed Ahu's Point Frigates, which in turn also means faster productions. We can expect to see an increase of encounters with these vessels. I hope you enjoyed and as always, I am eagerly awaiting any and all comments you may wish to share. Having those angular bare anti-stud facing plates makes it look less Ijad, maybe more free colonies like? 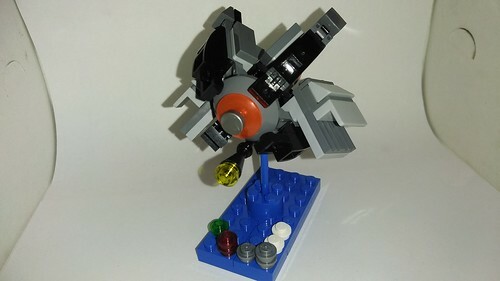 Just for the heck of it, I made one more Anti-Frame Fighter Ace from the FreeSpace games. 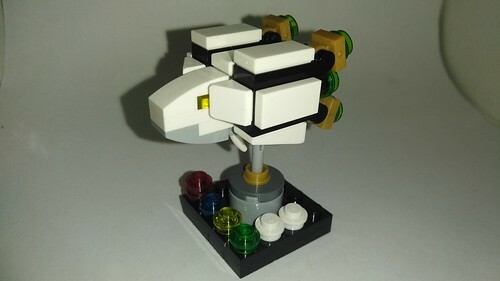 This one is the Hercules, one of the more iconic fighters from the series. 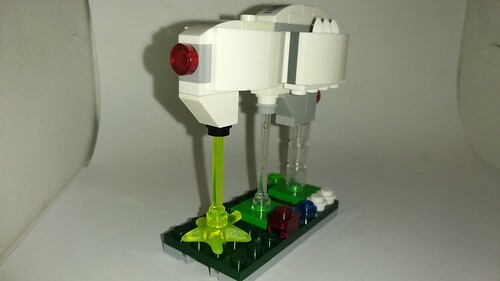 Loving the way you angle the Herc thrusters, it could be a good base for a frigate as well! Phobos Alt: Dual Assualt Range Torpedo Tubes, Multi-Layered Armor, Frigate Engines. The designers had asked if the Deimos should also incorporate the customized hardpoints, but instead they received the reply: "The Deimos is excellent the way it is. Why the bloody hell would we want to risk changing it?" The reason it's in two shades of green is due to lack of enough of the same color parts. 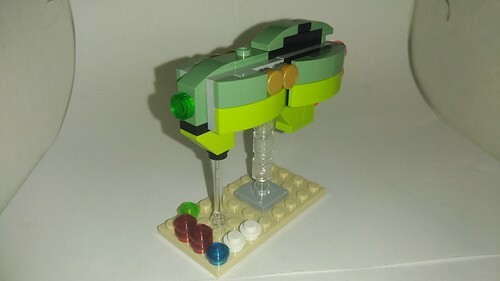 I originally wanted it to be sand green, but when I noticed I did not have the right parts in the same color, I split the difference to try and keep it semi color coherent. An additional gun on the underside, on that "chin", might look interesting! VitorFaria wrote: ...An additional gun on the underside, on that "chin", might look interesting! 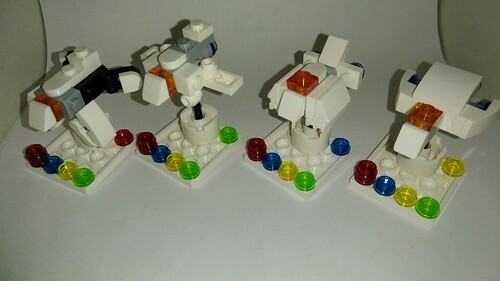 As promised, here are 3 new Phobos Class Frigates, some with weapons on the 'chin' as suggested by VitorFaria. I am still experimenting with the look but I think I came across a decent balance. 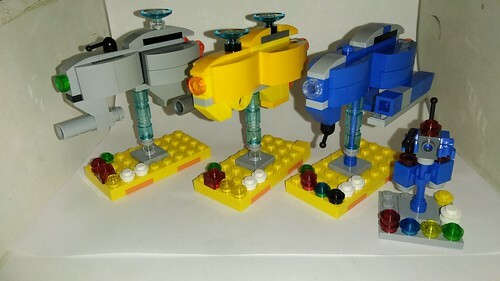 I did not have enough to make them all the same color so I hope you don't mind the differences. Hope you enjoyed and as always I eagerly await any and all comments you wish to share. I'm happy you incorporated the chin gun idea so readily, it works very well indeed!